This morning I sent Nicholas to school with 19 birthday party invitations in his backpack. 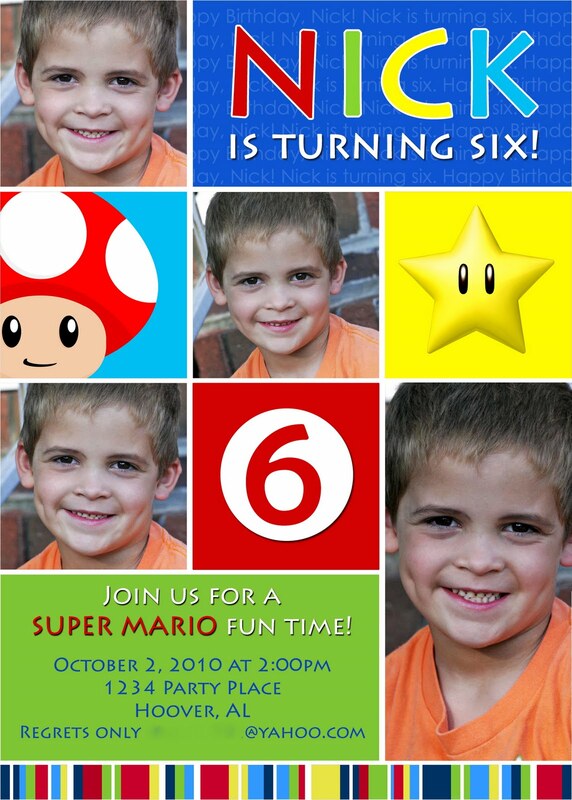 In less than a month, he'll be 6 years old, and I can't believe it. As I've done for the last several years, I asked my friend Heather to design a cute invitation for us, and she did a great job. I wanted something inspired by Super Mario, since Nicholas loves Super Mario and we're also planning an obstacle course party -- and Mario Kart and other Super Mario games are sort of like obstacle courses. She's also branching out into new things such as gift tags and return address labels. So talented! And a beautiful, Godly woman, too. I'm so happy that we get to kick off all of our happiest events -- birthdays and holidays -- with Heather. Plus, I love to support small business owners, especially those who share their talents with kindness, humility and joy. You can always find a link to Picture It Cards in my sidebar! Love the invite! It looks great! Ha! I figured they were supposed to be hearts. :) Caret 3, caret 3, caret 3 back atcha, babe.